MyPlate encourages us to make half our plates whole and the dietary guidelines also recommend we increase our intake of whole grains. This is all great and seems like it should be relatively easy to do, when in reality it is often difficult to know what is truly a whole grain and what is refined. Because whole grains are typically a good source of fiber, I decided to marry the two topics into one mini-lesson and activity where students become sleuths and decode a variety of grain products in order to determine which are truly excellent sources of both fiber and whole grains and which don’t make the grade (even if the labels are deceiving). Show students two loaves of bread; one white wheat bread and one whole wheat bread. Ask students to tell you the differences between the two loaves. Give them a sample of each to taste and ask them to describe the differences between the two loaves. Survey students to see who eats each type at home. Show students the wrappers and ask what the differences are between the loaves. Which is healthier? Use student responses as a way to introduce or review the terms whole grains and refined grains. Explain or review that whole grains contain all three parts of the grain kernel: the bran, germ and endosperm while refined grains only contain the endosperm. The bran and germ have been removed. When reading ingredients on a label it is important to look for clue words. For example, whole grain clues include such words as whole, cracked, rolled, flaked or 100% that precede any grain listed. Clue words for refined grains include enriched, pearled, white flour, oat bran, wheat germ or just plain wheat. Write these on the board or have students take notes. Because whole grains are usually high in fiber, I like to sneak in some information regarding fiber and it’s role in the diet. I begin be asking students what fiber is and why it’s important in our diet. A lot of students have heard the term but only a few actually know that it is a special carbohydrate that cannot be digested, but helps keep us full and rids our bodies of waste. In order to bring everyone up to speed I show this YouTube clip to give an overview of fiber. After viewing I do expect them to be able to tell me what fiber does for the body, the two types, sources and the number of grams females and males need daily. Depending on my time, I may or may not have them fill in a video guide sheet. It’s included below in case you wish to use it. I also go over the numbers on the nutrition facts label as they pertain to dietary fiber. Explain that 5 grams or more is an excellent source, 3-4 grams are good sources and anything less than 3 is a poor source. Students will need to know this later so I have them add it to their notes. Since fiber comes from plant based foods and we’re learning about whole grains, we are going to sleuth for levels of both on a variety of grain package labels to figure out which are the excellent sources all the way down to the poor sources. 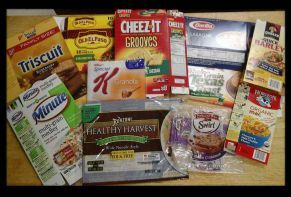 Have a variety of 10 grain product packages (including labels) that are a range of whole grain and refined sources as well as varying amounts of fiber grams set up around your room (I number mine.). Students circulate to each product and write the name of the product, the serving size, the number of grams of dietary fiber each contains and the entire first ingredient listed on the label. Afterwards, give students a highlighter and several different colors of markers or colored pencils. They will be using these to key or code their results. I read the coding directions to them as a group to minimize confusion, but a PPT is included below if you want to project it for students to do independently. Once students have finished coding their label information, they decipher the grain and fiber label codes by answering some questions (they may use their notes to help them). I don’t tell them this until after they have completed the follow-up questions to this activity, hoping they come to this conclusion as well, but any foods with both a highlight and a star are excellent sources of whole grains and fiber. Those foods with a sad face and a # are poor sources and should be eaten in limited amounts. Foods with a circle and star are good sources, while any with a single sad face are poor and should be replaced with healthier options. We also get some good discussion on how deceiving labels can be when they make claims such as “made with whole grains” or a “blend of whole grains”. I also like to discuss any new terms students may have encountered during this activity and finally I like to close with the question: Why is reading a food label like being a detective?